In New Zealand, it would appear that buildings grow on trees—or, rather, trees grow into buildings. 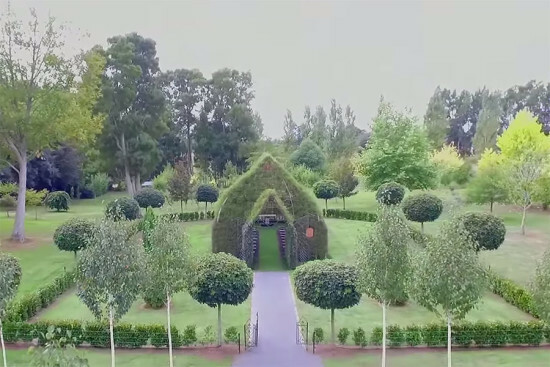 After years of careful maintenance, Barry Cox, tree aficionado, has created a lush chapel and garden in Waikato, just south of Auckland. Three-acres of greenery includes endless outdoor space that safeguards a masterpiece that Mother Nature could have coined herself—a tree-recycled church. Four years in the making, the concisely named TreeChurch is canopied by cut Leaf Adler, is composed of a Camelia ‘Black Tie’ lower border hedge, Acer ‘Globosums’ perched up on either side of the gateway, Thuja Pyramidalis and then closed off by Copper Sheen walls. The wrought iron windows were made by Barry himself, using leftover metal from his workshop, while the gates of the church were recycled from his family’s barn in Shannon. The altar, made of Italian marble, also comes from his hometown. It precedes over rows of wooden benches accommodating groups of 100 people. Outside the church, a line of Himalayan birch leads to a large labyrinth that Cox landscaped after the walls surrounding the ancient city of Jericho. Throughout the land, Cox scattered pieces of vintage gardening tools and placed them precariously by tree trunks for an aesthetic boost, not that nature’s beauty ever needed boosting. The decision to create TreeChurch and its surrounding gardens was not immediate but the development of such an idea began on the road. His religious upbringing and love for nature led him to tour around New Zealand, Europe, and the United States, meandering through the streets on a motorbike and all the while observing each church steeple and wooden archway with as much fascination as the 10 year old head altar boy he once was. His travels encouraged his desire to keep working with trees and later founded Treelocations, a business specializing in tree transplanting, removing, or relocating. Treelocations is one of three businesses in New Zealand that uses a “tree spade,” a crane-like machine that digs deep underground to scoop up all parts of the tree, including the root ball, thereby leaving it completely unharmed. After devoting much of his time serving Mother Nature’s voiceless mighty oaks, he then decides his next project: renovate his backyard. 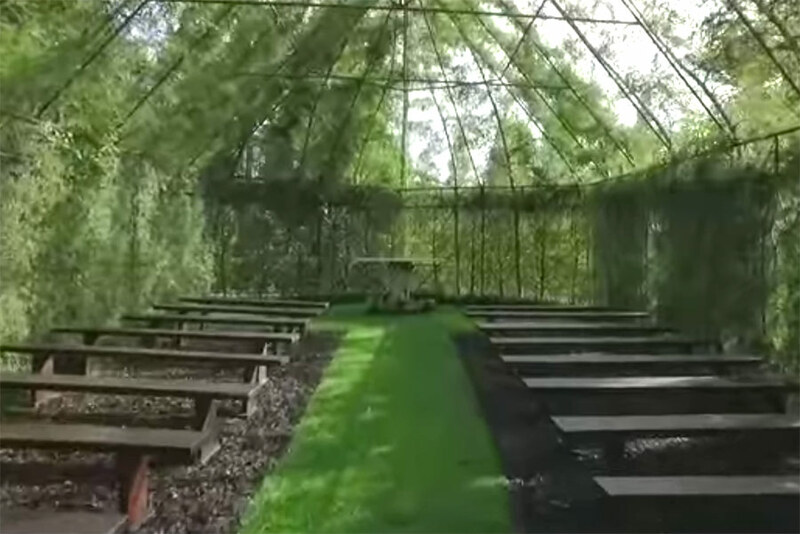 “I walked out my back door one day and thought, ‘that space needs a church,” he told New Zealand Gardener. In piecing together TreeChurch, he cross-pollinated his two loves and, not intending to do so, created a beautified marriage between landscape and architecture. Cox opened the TreeChurch Gardens to the public in January and is now available for public viewing and private events.